Introduction: Money for Nothing. The great American jobs scam: an intentionally constructed system that enables corporations to exact huge taxpayer subsidies by promising quality jobs – and then lets them fail to deliver. A system with a long history and many moving parts. At its core are corrupted definitions of “competition” that salute corporate bottom lines while thumbing their noses at common sense, social science, and good government. They are the legacy of a 50-year campaign by corporations to divide and conquer the states – as well as the suburbs – preaching a gospel that governments at all levels must never be allowed to cooperate. Chapter One: The Tax Dodgers Are Coming! The Tax Dodgers Are Coming! 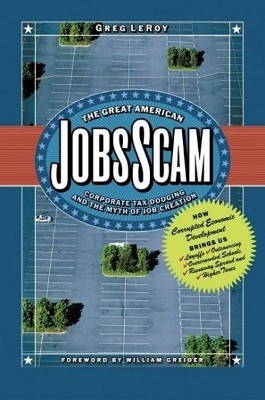 Fourteen illustrated scams, including: Job Blackmail (Raytheon); Take the Money and Run (Sykes): Payoffs for Layoffs (Bank of America and IBM); Exploit the War Among the States (foreign auto “transplants”); Exaggerate the “Ripple Effect” Benefits (Boeing); Pirate Thy Neighbor’s Jobs (from Los Angeles); Pay Poverty Wages, Stick Taxpayers with Hidden Costs (Wal-Mart); Bust the Union (Briggs & Stratton); and Ride Enron’s Coattails (ConAgra). Chapter Two: Site Location 101. How companies decide where to expand or relocate is driven by business basics – subsidies rarely make a difference. The trouble is, the way the system is rigged, companies are getting huge subsidies to go where they would go anyway. (Location Management Services, Hewlett-Packard, Toyota, Cabela’s). Chapter Three: Fantus and the Rise of the Economic War Among the States. In the depths of the Great Depression, a young Chicago industrial real estate salesman named Leonard Yaseen grew impatient with his father-in-law and boss, Felix Fantus. ...Thus was born the Fantus Factory Locating Service, one of the most powerful yet obscure consulting firms in U.S. history. (The birth of IRBs, Grant Thornton and the “business climate,” Mintax, Deloitte and Boeing, Ernst & Young on “Milking the Cash Cow”). Chapter Four: “Single Sales Factor” and the Corporate Assault on the Income Tax. Suppose you’re a manufacturing executive and you don’t like paying corporate income tax. How’d you like to get an 80 or 90 percent tax cut? No conditions, no strings attached. Just be sure your state manufacturers’ association keeps saying this gigantic tax cut will create jobs, jobs, jobs. Maybe rent an economist to issue a rosy study. (Fidelity Investments/Massachusetts, Illinois, Georgia, the Multistate Tax Commission and the Long-Term Corporate Assault on State Cooperation on Income Taxes). Chapter Five: Property Tax Abatements and Your Local School. Companies love to locate in areas with good schools; they just don’t want to pay for them. Families don’t get a 10-year holiday on their property tax for moving into their preferred school district, but companies often do. (Exxon in Louisiana. Poor Pay More in Ohio, TIF on Steroids in Illinois, International Paper “double dipping” in Maine). Chapter Six: Subsidizing Sprawl, Subsidizing Wal-Mart. Taxpayers often subsidize sprawl – in the name of jobs (TIF, enterprise zones). The economic war among the states is a serious problem, but so is the economic war among the suburbs. Stay tuned as we investigate the real suburban issue today: is a mall “blighted” unless it has a Nordstrom? We report. You decide. (Wal-Mart, Proposition 13, “Greyfields” and “Ghostboxes,”). Chapter Nine: Building a New Consensus for Reform. You’d think that our public officials would be proposing drastic solutions, but the typical debate these days is about cooking up new giveaways. We are, after all, talking about $50 billion a year worth of entrenched self-interests, so there is no silver bullet. Only an organizing approach to the problem will do. (Clawbacks, Job Quality Standards, Unified Development Budgets, Smart Growth Policies, School Board Say on Abatements, Regulate Site Location Consultants, Community Benefits Agreements, A Federal Carrot Against Job Piracy).